In 1976, Spencer Heath MacCallum walked into Bob’s Swap Shop in Deming, New Mexico. There, among the battered pans and chipped china, he came across three, handmade, ceramic pots. Each was perfectly symmetrical, with red and black painted geometric designs covering the extremely thin clay walls. He purchased the pots and took them back home to California. Over the coarse of the next month he couldn’t get the three pots or the unknown maker out of his mind. On his next trip back he asked the owner of the Swap Shop if she had any idea who made them. She did not, but suggested that “Mexico would be a good place to start.” Spencer decided then and there he must find this artist. With only three pictures of the pots to go by, he set off through northern Mexico looking for this unknown potter. 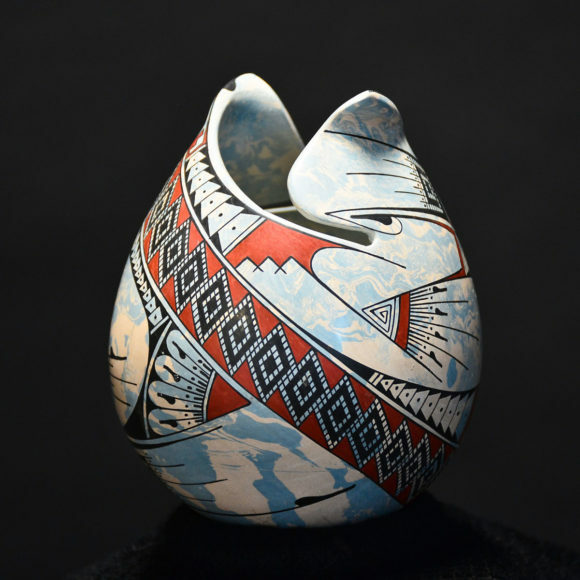 He assumed it must be a woman, as all the great American Southwest potters had been: Nampeyo, who revived the Hopi pottery tradition, Maria Martinez (Poveka) of San Ildefonso Pueblo, and Lucy Lewis of Acoma Pueblo. After a day or two of searching, they were given a tip about a village called Mata Ortiz. Upon arriving he ran into a boy on a burro who led him to a small adobe house that backed up to a river. As he began to pull out the pictures a gentleman walked in the back. It was Juan Quezada. Juan said he had finished those pots about six months prior and pulled two more down from a shelf to prove to the norteamericano that he had made them. Spencer and Juan began a relationship where he would give Juan a $300 stipend per month for all the pots that Juan could produce. This led to the big break for the pair, through Spencer’s contacts, in May of 1977, the Heard Museum in Phoenix displayed thirty-four of Juan’s pieces as part of an exhibition titled “The Other Southwest, Indian Arts and Crafts of Northwest Mexico.” It took awhile for the traditional farmers and cattlemen to take to pottery but by 1990 there were as many as 300 potters working in Mata Ortiz. Now, over 40 years after those first encounters between Spencer and Juan, each of the potters of Mata Ortiz have their own unique shapes, colors and designs in and on their pottery. American Trails is proud to display over 25 of these wonderful artists in our gallery in downtown Ashland.